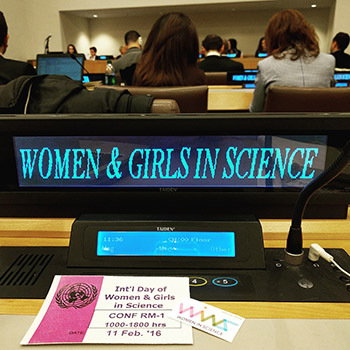 It was just three years ago that the United Nations declared February 11 the International Day of Women and Girls in Science. This day celebrates the accomplishments women have made toward achieving equity in the science, technology, engineering and mathematics (STEM) fields. It is also a day to reflect on the work we still need to do to ensure all women and girls have equal opportunity and resources to pursue STEM and drive research and innovation. In Canada, women represent 60 per cent of all university graduates, yet only account for 22 per cent of graduates in engineering programs and 30 per cent of graduates in mathematics and computer science programs. While we have good data on representation in these fields, research is ongoing to improve our understanding in regard to why women do not pursue STEM, or, if they do, why they tend to exit these fields at higher rates than men. Some studies do provide us with a better understanding of these gender differences. For example, the majority of children who are asked to draw a scientist draw a man (although this is slowly changing over the years). We also know that encouragement from teachers and parents makes a big difference in girls’ retention in STEM. At Laurier, the Centre for Women in Science (WinS) is working to fill the knowledge gaps in this area by connecting social science and STEM researchers. From an interdisciplinary perspective, we are better positioned to understand the relevant social and cultural factors at play for women in STEM. The researchers at WinS have helped inform policy and legislation and offer consulting services to the federal government and, most recently, organizations like UNESCO. At Laurier, we have exceptional scientists supporting WinS. Dr. Shohini Ghose, a professor of Physics and Computer Science at Laurier, is the founding director of WinS. In addition to her work in quantum information science, Shohini works on research projects that explore and address gender inequities and broader diversity in science. Dr. Eden Hennessey, research and programs director at WinS, researches the consequences of confronting sexism in STEM. Eden is one of only a handful of social psychologists who bridge the gap between social science and STEM. In 2016, she was invited to the inaugural celebration of the International Day for Women and Girls in Science at the United Nations in New York City and has presented her photo-research exhibits on women in STEM at Canada’s High Commission in London, England. Beyond research, WinS also organizes social and educational events, assists with student advocacy, and offers student awards and research grants. I am so proud of the work that WinS is undertaking to not only better understand the barriers women face in STEM, but also to support and mentor women who pursue careers in these fields. As a scientist, I often find myself having the wonderful opportunity to influence girls and young women who are interested in all types of STEM disciplines. Making STEM careers more accessible for the following generations is important to many women in STEM, and research demonstrates that young women who know a woman in a STEM profession are more likely to feel empowered when they engage in STEM activities. At Laurier, we have the privilege of working with many women and men in our science programs who provide active and engaged mentorship to students in K-12 and through undergraduate studies and graduate schools. I am encouraged to see that in 2019, we have more and more STEM role models for young women in Canada. Just a few months ago, Dr. Donna Strickland at the University of Waterloo won the Nobel Prize in Physics. Our Governor General, Julie Payette, is an engineer and astronaut. The Federal Minister of Science and Sport is Dr. Kirsty Duncan, a university professor who teaches medical geography and global environmental processes. It is through role models like these that young women will find mentors and exemplars to challenge the notion that women do not belong in STEM, a factor related to attrition. The world needs women in science. If half the population isn’t fully represented in these areas, we will miss out on valuable perspectives and insights that could lead to new discoveries and innovation. On this day, we must commit to mentorship, research and challenging stereotypes, so we can ensure that all girls and young women can pursue exciting careers in STEM. On March 8 (International Women’s Day), Laurier and the International Women’s Forum are hosting a luncheon and panel discussion featuring women in science. I invite you to join us in what is certain to be a lively discussion about advancing women in science, technology, engineering, arts and math (STEAM).